On the occasion of the ARRRGH! Monstres de Mode exhibition at la Gaîté lyrique, Paris, Atopos cvc invited A Shaded View On Fashion Festival (ASVOFF) to present a special ‘monstrous’ screening. Curated by Diane Pernet and David Herman, this screening presented videos by Rick Owens, Bernhard Willhelm, Jean-Paul Lespagnard, Bart Hess, Mareunrol’s, Charlie Le Mindu, directed by Nick Knight/SHOWstudio, Elisha Smith Leverock, Erwin Olaf, Andrew Huang and Zoe Hitchen, amongst others. 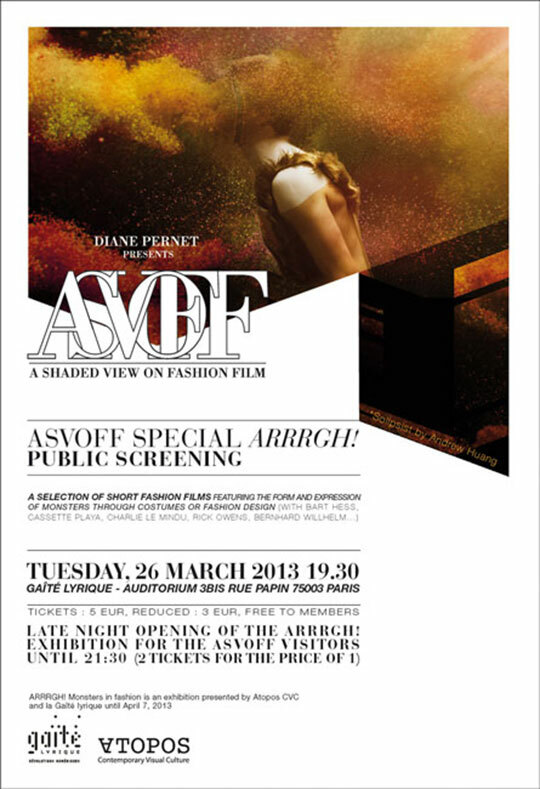 Founded by Diane Pernet, world-renowned fashion critic and video journalist, ASVOFF has gained critical acclaim for encouraging both emerging and established artists to reconsider the way that fashion is presented and for challenging the conventional parameters of film. Since its launch in 2008, ASVOFF tours the globe with subsequent screenings at prestigious institutions and events like the Guggenheim, the Barbican, Art Basel Miami, CaixaForum Barcelona and the Cannes Film Festival in a host of creative capitals such as New York, London, Tokyo, Milan, Moscow, Mexico City.